I think it's safe to say that I am an eclectic person. Not only in my wardrobe, but also in my never-ending and constantly changing taste in how to decorate our home. My heart rate literally speeds up when I look at design blogs and see just how freaking creative people are with their nests, and this week was an overload of inspiration. First was the launch of Rue, this amazingly fresh and stylish online zine that fills a much-needed hole left by magazines such as Blueprint, Domino and (sigh) Budget Living, who all folded. Helping fill that hole is Lonny, which launched last October. I read both of them cover to cover this week, and now my mind is absolutely swimming with ideas! So, I thought weekends here at the Parsimonia blog could go whimsical (with a pinch of "wild" still popping up here and there). It'll be a fun, laid-back way to take you into your two days of freedom, and hopefully inspire you to tackle some decorating or DIY in your own home! This weekend I (via Lonny) bring you the home of Ben Brougham, curator of Jonathan Adler's retail stores and a native Brit who has embraced American design. 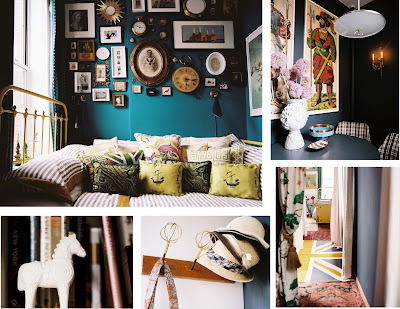 His abode was featured in the August/September issue, and I absolutely fell in love with his eclectic collection of antiques paired with modern pieces, especially the displays he's put together on his walls. Ours are still relatively blank, so I'm on the hunt for inspiring ideas on how I could cover them. 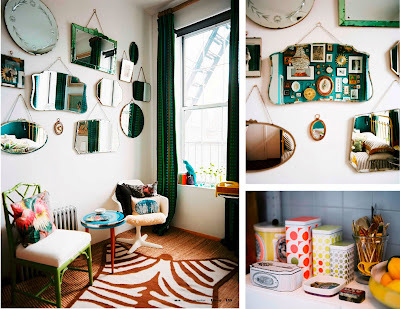 I think what I love most about interiors like these is the feeling that you're walking around in an antique store or flea market, and being in awe of the master puzzle they've created with each piece they collected. Plus it leaves room for us eclectic folk to constantly evolve our interiors and create truly living art in a sense. Hope this has left you inspired! Have a great weekend!